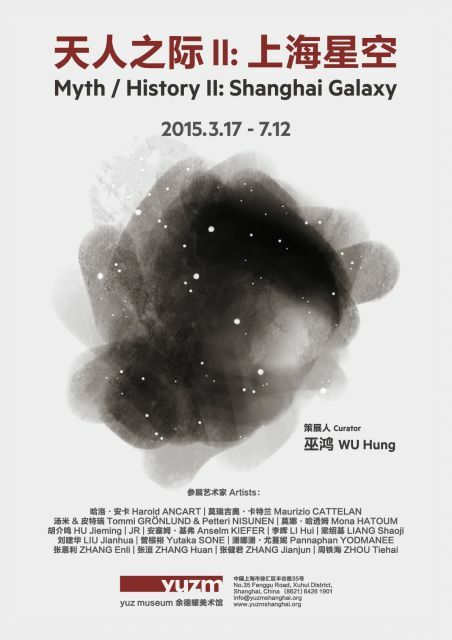 The Yuz Museum Shanghai is pleased to announce the upcoming exhibition Myth / History II: Shanghai Galaxy from March 17 through July 12, 2015. An opening reception will take place on Monday, March 16. Myth / History II: Shanghai Galaxy continues to explore some basic tendencies and logic in contemporary art and how we construct its narrative. The exhibition provides esteemed artists over the world to share their artistic accomplishments with the public meanwhile focus on Shanghai City’s development on contemporary Art. It is an exhibition of works in various media, such as installation, video , painting and photography, giving viewers a richer sensory experience. This group show will include: Harold Ancart, Maurizio Cattelan, Grönlund Tommi, Mona Hatoum, Hu Jieming, Anselm Kiefer, Li Hui, Liang Shaoji, Liu Jianhua, Petteri Nisunen, Sone Yutaka, Pannaphan Yodmanee, Zhang Jianjun, Zhang Enli, Zhang Huan, Zhou Tiehai. Courtesy of the artists and Yuz Museum.